SBG Portarlington’s Head Couch Philip Mulpeter is getting the chance to bring his career to the next level with a massive fight that will take place before the end of the year. Mulpeter (9-5), will face Denmark’s Nicolas Dalby (15-3-1) in a welterweight contest at Cage Warriors 100. The UK-based company, which is one of Europe’s leading mixed martial arts organisations, is billing the event as the biggest in its history. It will take place at the Ice Arena in Cardiff on Saturday, 8 December. 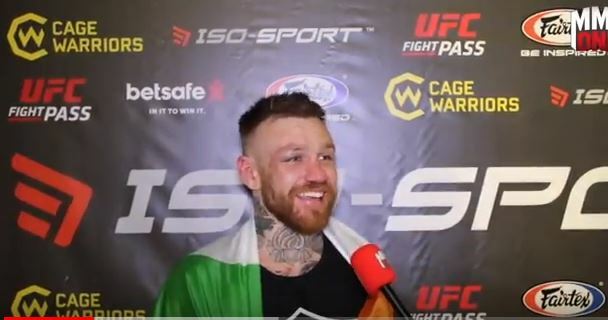 One of Ireland’s most highly-respected professional MMA fighters, Mulpeter was part of a crop of rising prospects that included team-mates such as Conor McGregor, Cathal Pendred, Aisling Daly, Paddy Holohan and Artem Lobov. After a three-year hiatus from competing, ‘The Honeybadger’ made his comeback last December. An impressive win over durable veteran Ali Arish was followed by a big statement in June, when he returned to Cage Warriors with a third-round submission of hometown favourite Jan Quaeyhaegens in Antwerp, Belgium. SBG Coach wins big again ! Nicole Turner has been chosen as the Ambassador for the Olympic of Ireland Sport Federation. Congratulations to O'Deas on their award for best emerging Irish Food . Well done to all who work there. Aine Graphics Portarlington Check out the great St.Patrick's day offers now ! The PCDA is a non profit organisation, it comprises of a Voluntary Board of Directors working to improve the economic, social and cultural development of the town of Portarlington and the surrounding areas. We work in partnership with the community, voluntary groups and statutory agencies for the benefit of the community.